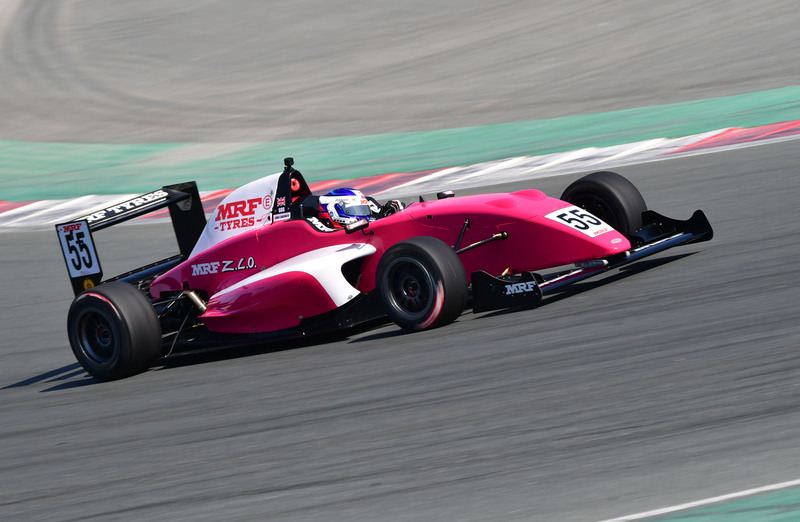 Dubai, November 15: Jamie Chadwick, the only female driver on the 12-car grid, put the marker down for the first round of the MRF Challenge championship by topping both the Free Practice sessions at the Dubai Autodrome, here on Thursday. Chadwick, 20, from Bath, England, came out on top in the two, 30-minute practice sessions, clocking a best of one minute, 59.218 in the first outing and 01:59.774 in the next around the 5.390 Kms circuit as she made her debut in the MRF Challenge on a high. She survived a tough battle with Czech Republic’s 16-year old Petr Ptaceck who was second fastest in both the sessions, clocking 01:59.581 (FP1)and 01:59.918 (FP2). Chadwick, who created history in 2015 when she became the first female and youngest winner of the British GT Championship, and Ptacek exchanged fastest laps in the closing minutes of FP-2. However, Chadwick went quicker on last flying lap to top the time charts. Less than a second separated the top eight drivers. “I learnt a lot today – new circuit, new car. I am happy with the way we ended up today in these conditions and I look forward to the races,” said Chadwick. In the first free practice session this morning, one second covered 10 of the 12 drivers, promising a close contest over the five races scheduled for the first round of the championship. Chadwick recorded her fastest lap of the session on her 14th and final lap as did the rest who all went quicker through the 30-minute practice. The top four, Chadwick, Ptacek, Defourny and Young, all posted sub-two-minute laps. For the lone Indian entry, Chetan Korada, 32, from Chennai, it was his first run at the Dubai Autodrome and he focused more on learning the tricky track with its blind crests leading into corners. FP-1: 1. Jamie Chadwick (UK) (01min, 59.218secs); 2. Petr Ptacek (Czech Republic) (01:59.581); 3. Max Defourny (Belgium) (01:59.656); 4. Dylan Young (Australia) (01:59.697). FP-2: 1. Jamie Chadwick (UK) (01:59.774); 2. Petr Ptacek (Czech Republic) (01:59.918); 3. Danial Frost (Singapore) (02:00.115); 4. Andreas Estner (Germany) (02:00.276).